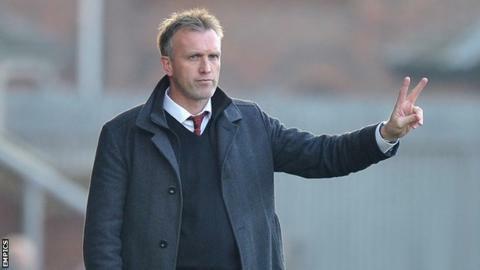 Crewe Alexandra manager Steve Davis says he has "never doubted" he is still the right man to be in charge of the League One club, despite their position at the bottom of the table. The 50-year-old, who marks four years as Alex boss on 14 November, is sure he can improve his side's fortunes. "Of course, I've never doubted or felt that I wasn't," said Davis. "If there's a better man out there who can do a better job, I'm sure the board will recognise that and I understand." In his time at Gresty Road, Davis has taken Crewe into the third tier via the play-offs and won the 2013 Johnstone's Paint Trophy, while also trying to keep his squad competitive despite tight financial constraints. After narrowly escaping relegation last term, this season has been a struggle for the Alex who have only won three out of 16 league games and were knocked out of the FA Cup by National League side Eastleigh. "It's become popular to sack managers because people get fed up of them," Davis added. "I don't think that young fans understand the importance of continuity at football clubs. "Sometimes new managers work, most times they don't - you've only got to look at teams like Leeds, who haven't been able to find the answers. "We have a challenging world at Crewe but it's a job I thoroughly enjoy and I'm 100 per cent with the club and want to improve."